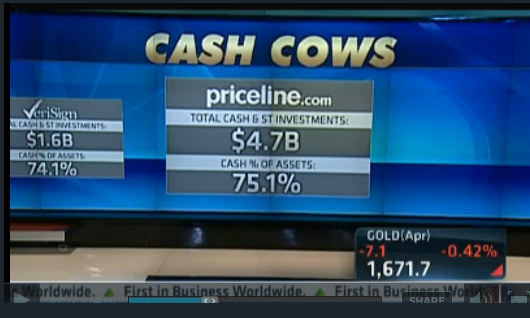 "That's why we look at cash" indeed. It can't be chalked up to a simple mistake or misreading of the graphic. 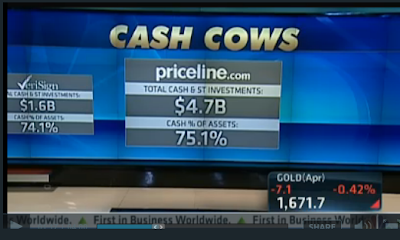 Anyone who thinks a high-flying internet stock like Priceline could be trading anywhere close to cash on the balance sheet has absolutely no clue what is going on in the market. I can't believe they ran a whole segment on this and nobody told Sullivan he had no idea what he was talking about. Anybody who uses CNBC for financial information and insight is duly warned. The guy is such a douche-bag!